Sadd Tunnel, a part of the 22 February Interchange and Al Amir Street development project, was opened to commuters in April 2010. A flyover at East Industrial Street was opened in May 2010. A new underpass on the D Ring Interchange. D Ring Road service roads. Artist's impression of the Industrial Interchange of the Doha Expressway. Artist's rendition of the F Ring Road. 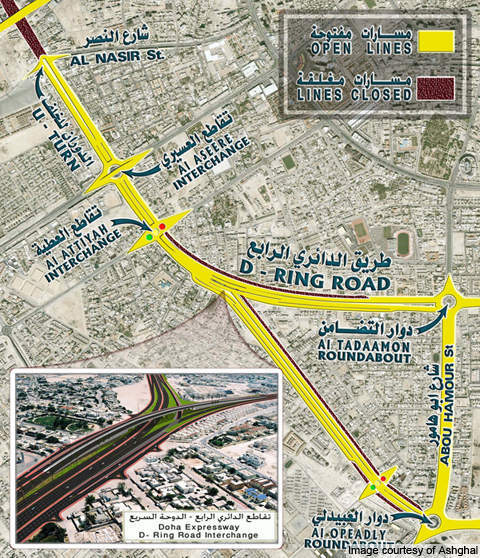 The G Ring Road of the Doha Expressway. The Doha Expressway is a significant infrastructure project being carried out in Doha, Qatar. It will connect the south of Doha with the north, and the east with the west. Estimated at QR15bn, the project construction began in late 2007 and is expected to be completed in 2015. The project is a part of the country’s road building program which is designed to reduce congestion, journey times and environmental impacts, and improve the flow of traffic. The Doha Expressway is Qatar’s first freeway. It was undertaken by the Public Works Authority of Qatar (Ashghal) to provide a modern road network throughout the urban and rural parts of the city of Doha. The project is being carried out in 13 phases/packages. In order to ensure smooth traffic flow, several underpasses, flyovers and interchanges are being built. Phases one and two involved the construction of a 6km, three-lane dual carriageway between Garrafa Interchange to Asiri Interchange. Named as 22 February / Al Amir Street Interchange, the carriageway was opened to traffic in June 2010. Phase three included the construction of the Industrial Interchange project which was completed in September 2010 in four stages. A new flyover connecting Doha with the Industrial area was opened in May 2010 and the 1km-long underpass with a three-lane dual carriageway at the intersection of Salwa Road with Furousiyya was opened in April 2010. 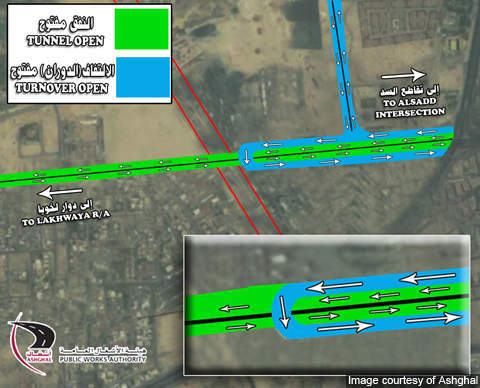 A three-lane dual carriageway bridge along Salwa Road was opened in November 2009. 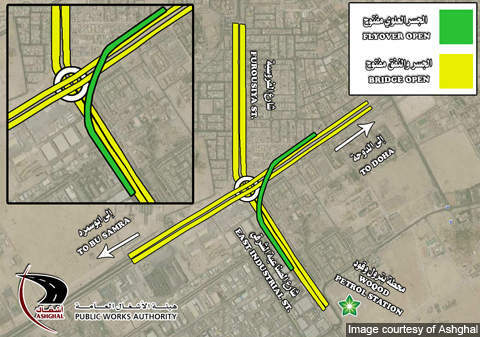 Phase four of the project involved construction of a three-lane dual carriageway (3.2km) from Midmac / Asiri Interchange up to E-Ring Road and Al-Muntazh Street intersection. Phase five which was completed in 2010 involved the construction of a 3.3km-long three-lane dual carriageway from Khalifa Al-Attiyah Interchange to Airport Interchange. 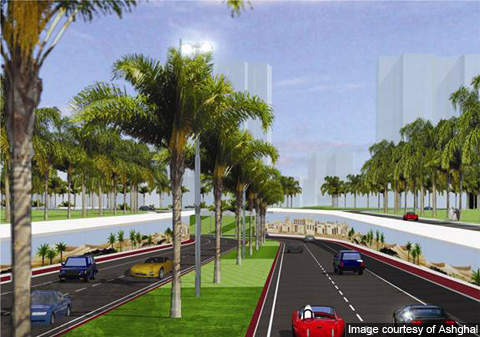 A three-lane dual carriageway (3km) from Industrial Interchange to Street 33 will be constructed in phase six. 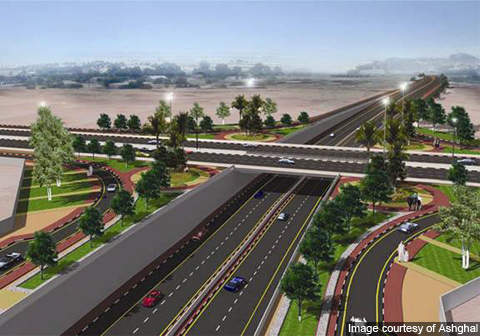 Construction on phase seven, which includes construction of four-lane dual carriageway between Industrial Interchange and Asiri Interchange, commenced in the second half of 2010 and is expected to be completed in 30 months. Phase eight involves construction of 4km-long three-lane dual carriageway from Asiri Interchange to A-Ring Road. Construction of a 10km-long three-lane dual carriageway from E-Ring Road / Al-Muntazah Street intersection to New Doha International Airport will be carried out in phase nine. In phase ten a 19km-long three-lane dual carriageway called G-Ring Road will be constructed from Road 55 to New Doha International Airport. A three-lane dual carriageway, extending 3km in length from Industrial Interchange up to Street 33, will be completed in phase 11. 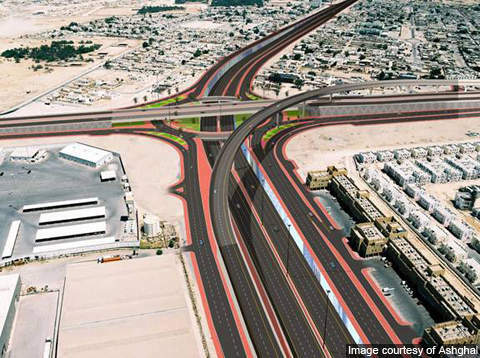 Phase 12 will involve the construction of 8km long F-Ring Road, a three-lane dual carriageway from Abu Hamur Street / Al-Muntazah Street intersection to New Doha International Airport. It is expected to start in March 2011 and scheduled for completion in 2013. The last phase, phase 13 includes the construction of Al-Muntazah Extension, a three-lane dual carriageway from the intersection of East Industrial Road and Street 33 to Al-Muntazah. In February 2011, Ashghal awarded a contract to KBR to provide program management services and engineering support to 30 Expressway projects, including the Doha Expressway. The concept design of the expressway was provided by Parsons. The QR600m Industrial Interchange project (phase three of Doha Expressway) contract was awarded to Konstruktor Inzenjening in 2006. In June 2010, AECOM was awarded a $10.7m contract to provide general, site supervision and quantity surveying consultancy services for package seven of phase two. Yuksel Insaat and MIDMAC Contacting joint venture (JV) were awarded a contract for the Salwa Road-Phase two. The contract involves construction of four signalised interchanges with three underpasses, new asphalt pavement, 2,200 linear metres of micro tunnelling, a new storm water drainage system and relocation and upgrade of the existing utilities networks. 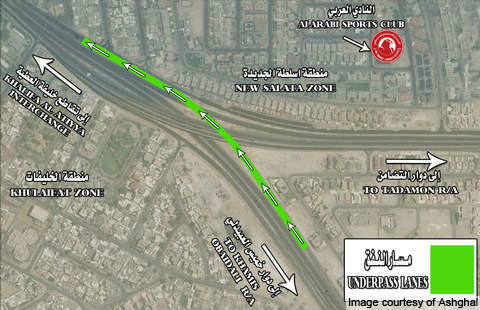 The construction contract for phase 12 (F-Ring Road) was awarded to the Consolidated Contractors Company in January 2011. In December 2005, a QR988m contract for the construction of phases one and two was awarded to a joint venture between German based Bilfinger Berger and UAE based Al Hamed Construction and Development. The contract was however cancelled in August 2009 due to a payment dispute between Bilfinger Berger and Ashghal. The uncompleted works were awarded to three local contractors – Boom Construction, Bin Omran Trading & Contracting Company and Qatar Asphalt Company.